You’re on a budget, but you need reliable programs that will make your 9-to-5 run more smoothly. One free application that belongs on every tech-savvy businessperson’s list is LogMeIn, which lets you access a computer remotely to fix it or to find files. LogMeIn has been around, but the company recently released a free version of its iOS app, so you can have remote access to your Windows or Mac desktop from your iPad or iPhone. Although the screen gets a bit cramped, it’s still a terrific no-cost tool. If you’re on the Web regularly, consider installing a tool like Ghostery, which is available for Chrome, Firefox, Internet Explorer, Opera, and Safari. This simple browser add-on scans for information trackers across the Web, and pops up an alert when a site is tracking you. Note that it sends statistical data from your scan back to HQ, to make the product stronger. You probably store a ton of critical files on your work computer--things that you can’t afford to lose if your hard drive fails. The CrashPlan backup utility (available in 32-bit and 64-bit versions) can prevent such disasters. Even though the free edition doesn’t offer online backup, CrashPlan does automatically back up your files, and it lets you back up to colleagues’ systems (whether they run Windows, Linux, or Mac OS). Need to focus on writing a business plan or another important document, without everyday distractions such as email alerts, banner ads, and status updates? Try OmmWriter Dana I, a downloadable word processor that fills your screen with a soothing background color, and allows you to write without a lot of distracting buttons and menus up top. It’ll even play gentle sounds to fill the bothersome silence that comes with writer’s block. If you have to work in Word but need to edit documents on the go as well, check out CloudOn, an iPad app that provides full access to Microsoft Office. (Note, though, that CloudOn needs to access a Dropbox account to function.) The service is free for now, but the company stipulates that it may end up charging for some of its more advanced features later. Giving presentations to remote audiences is no hassle with AnyMeeting, which lets you easily conduct webinars. The free tool requires just one person to register, and then that user can invite up to 6 people to stream video and up to 200 guests to watch a presentation. For an in-person approach to presentations, turn to the Google presentations app (part of Google Docs), which lets you create a slideshow and even allows multiple coworkers to collaborate on a slideshow. While Google doesn’t have a huge selection of themes and personalizing touches, it does permit you to upload your own backgrounds for more-original slides. If you’re listening to someone else’s presentation, use the Tape-a-Talk Android app. 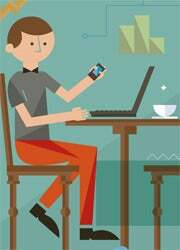 It employs your phone’s mic to capture everything said at the meeting, so you don’t miss a beat. Trying to stay on task can be a challenge, especially if you’re on the move. 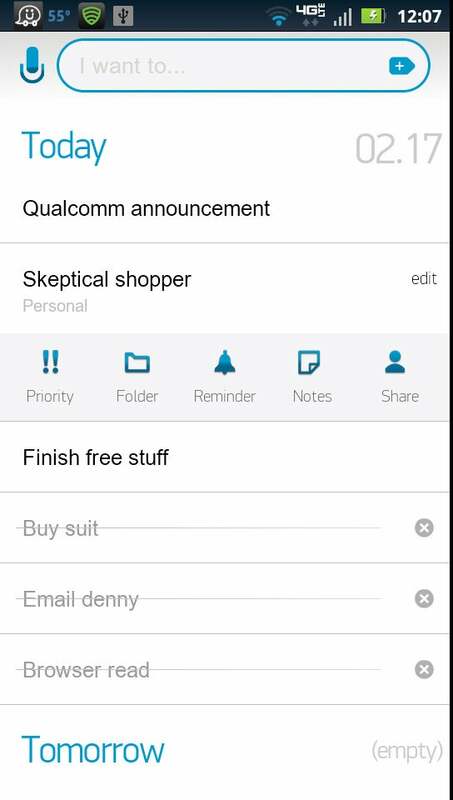 The free app Any.DO (for Android, and coming soon for iOS) is a basic to-do list, but the clean and straightforward design makes putting items on your list easy. You can set reminders for items, or share them with friends who have Any.DO. And if you meet people when you’re out and about, and you want to keep their contact info safe, use CardMunch (for iPhones only) to snap a picture of their business cards and add the details to your contacts. Chances are, if you’re doing business you’re also sending lots of mail. K-9 Mail is an improvement on Android’s preloaded email app, and it can support POP3 and IMAP email. You can load several accounts into K-9 and view your messages all in one unified inbox, or in individual folders. If you want to send a few large files over email (for instance, you need to send an audio file to a coworker for a presentation), you can use YouSendIt Lite; though the free version of YouSendIt allows you to send files only up to 50MB, that’s still twice as big as Gmail’s file-size limit. And if you’re planning on sending physical mail rather than electronic mail, Parcel for iOS and Parcels for Android (made by two different developers) can track all of your shipments over dozens of carriers. At the end of the day, are your eyes tired from all the computer work you’ve done? Try downloading F.lux, a Windows utility that dims and brightens your monitor depending on the time of day so that a superbright screen doesn’t blind you when you’re working late into the night.